A modern glass building surrounded by manicured lawns and a grove of trees may sound beautiful, but it is deadly to birds. The windows reflect their surroundings, disorienting birds and causing deadly head-on collisions. This cormorant was rescued after a passerby found him lying stunned just outside a glass building in Brooklyn, far from any water source. Double-crested cormorants (Phalacrocorax auritus) are migratory water birds, spending their winters on the Gulf Coast and their summers in freshwater lakes and swamps across the Northeast. Our patient was probably on his way to a nesting site before getting diverted for medical attention at the Wild Bird Fund. At the Center, the cormorant was found to be dehydrated and was put on a hearty diet of fish, monitored for long-term brain injury, and got daily swims in the rehabilitation pool. Cormorants are expert divers, and unlike most water birds their feathers actually trap water to reduce buoyancy, allowing them to reach depths of up to 20 feet. Afterward they stand with wings stretched out to dry by the sun. 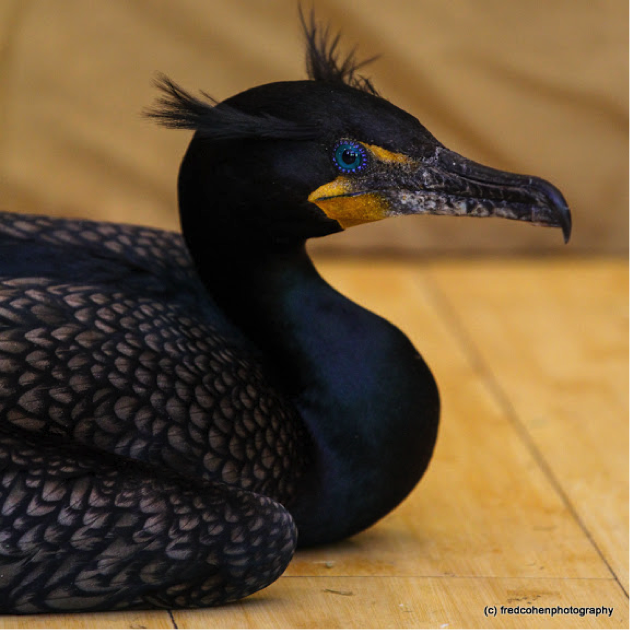 The double-crested cormorant was successfully released on May 1 into the West Pond at the Jamaica Bay Wildlife Refuge. Birds from the Wild Bird Fund are normally released in the area where they are found, but this Cormorant was on the wing, migrating north, when he struck the building in Brooklyn. So when it’s time to release a migrating bird the WBF tries to help them along their way, releasing them by an appropriate water and food source and away from the obstacle course of buildings. He flew out over the water the minute the box was opened, arching into the distance and landing near another pair of cormorants who immediately came over to say hello. After 15 minutes the three birds were diving together, and our double-crested cormorant was on his way home.